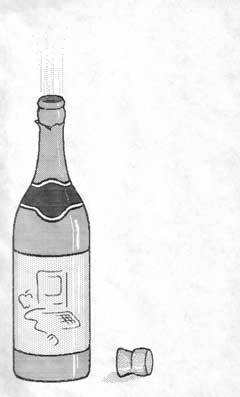 Bill Atkinson began writing MacPaint in February 1983, just after Susan Kare joined the Mac team to design bitmaps for fonts and icons. 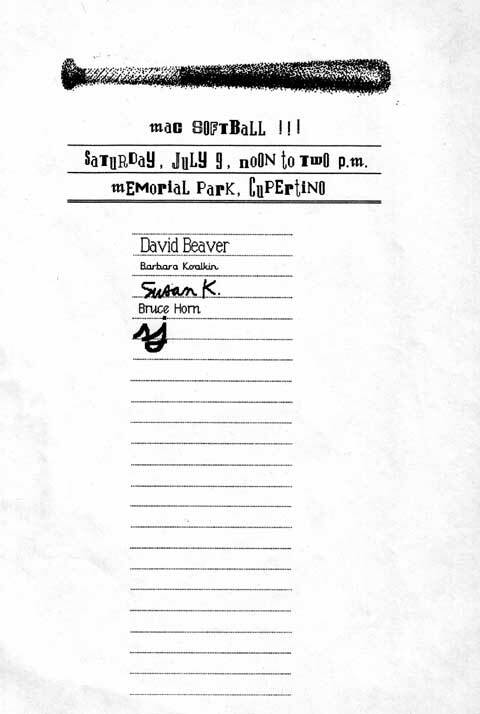 Susan became one of the first and most accomplished users of MacPaint, trying out new features as they were developed and using it for a wide range of practical applications. 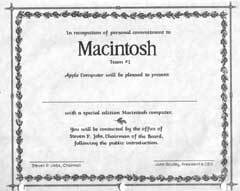 Susan kept a notebook of many of the MacPaint documents that she created as the Mac team struggled to finish the Macintosh throughout 1983. 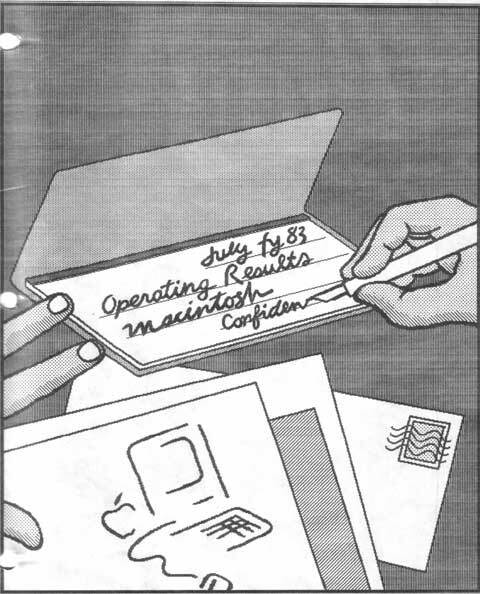 They provide an interesting glimpse of the daily life of the Mac team during that period. I'm pleased to be able to present scans her beautiful drawings here as part of Macintosh Folklore. You can click on an image to see a larger rendition of it; use the back button to return to the story. 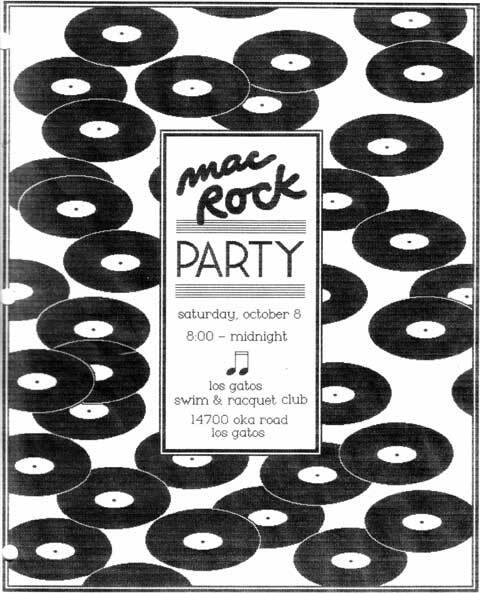 The image on the left is an annoucement of a combined birthday party for seven Mac team members whose birthday was in early April, including myself, who was terrified of turning 30 at the time. As a birthday gift, Susan made a jersey for me with a large hexadecimal number "1E" (which is 30 in base 16) on it, so I could still say I was a teenager, at least in hexadecimal. 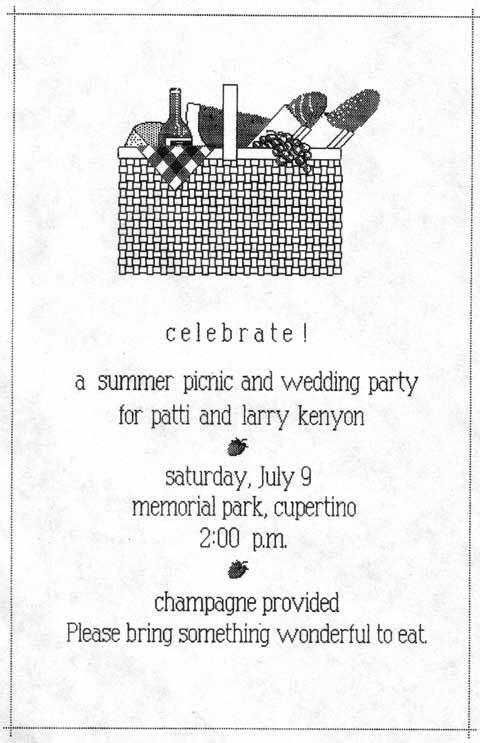 The image on the right is for picnic held in July to celebrate the wedding of two members of the software team: programmer Larry Kenyon and librarian Patti King. Larry and Patti actually eloped in June; the picnic happened after they returned from their honeymoon. One of the most important activities during the last couple of months before shipping was software testing. We held some testing marathons, where the software team enticed employees from the rest of the division to stay late and help test the software by bribing them with dinner (see 90 Hours A Week And Loving It!). 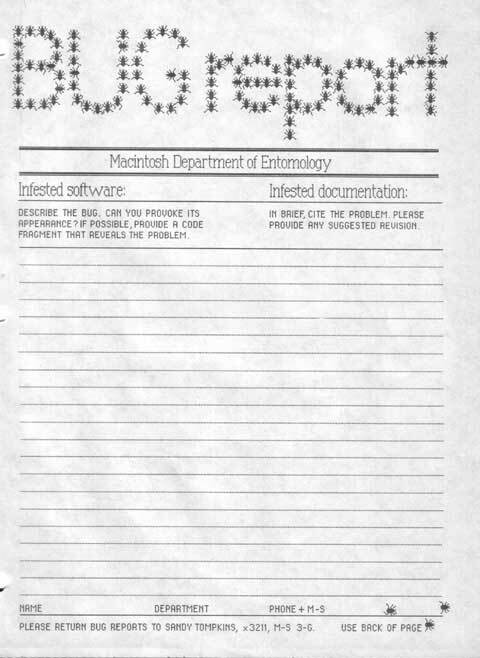 The image on the left is an announcement of another bug hunt, and the one on the right is a bug report form that was used during the testing. 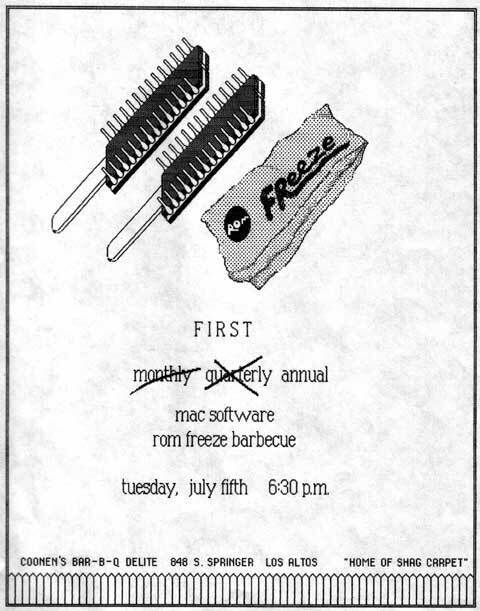 Here is an invitation to celebrate a ROM freeze at software manager Jerome Coonen's house. This wasn't the final ROM freeze, which took place in September, but the first of a series that led up to it. 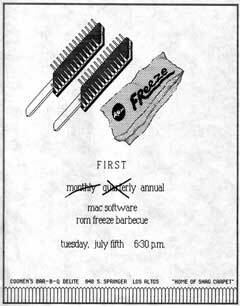 We had a party celebrating the final ROM freeze at Woz's house in Scott's Valley. The Mac group worked hard, but we occasionally had parties thrown by Apple for the team, sometimes with unusual themes. 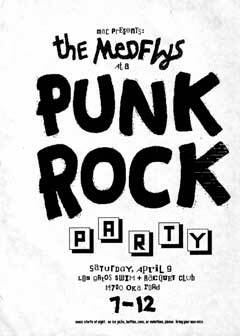 The left most poster promoted our "Punk Party", which we were supposed to attend in "punk" attire and featured the local band "The Medflys". 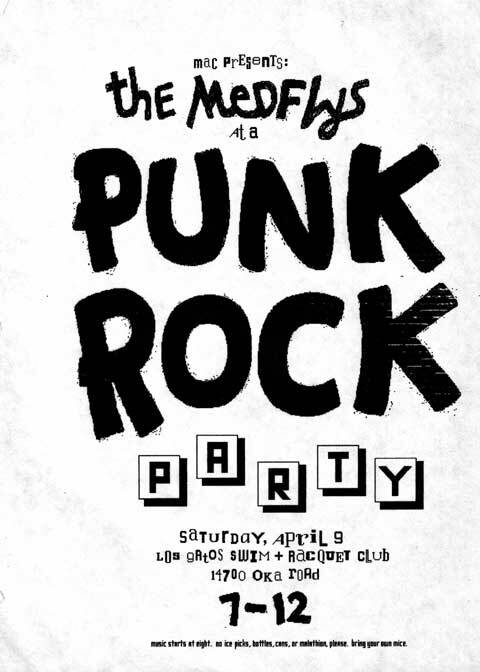 The poster on the right advertised a dance with music supplied by a DJ. Some of us were so disappointed with the music that he played that we drove to a nearby record store during the party to buy some better music to play there. 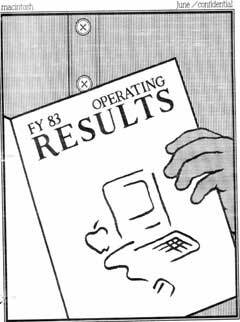 Steve Jobs was very visually oriented, and everyone knew that he reacted more favorably to material presented with nice graphics and high production values. 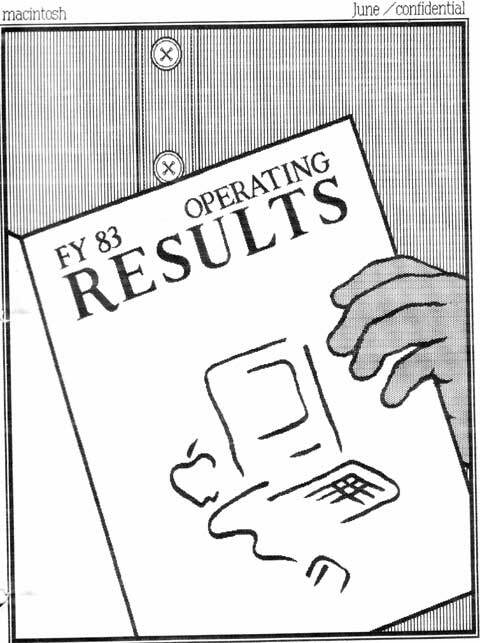 Susan was recruited by the Finance team to use MacPaint to make attractive covers for the monthly financial reports. 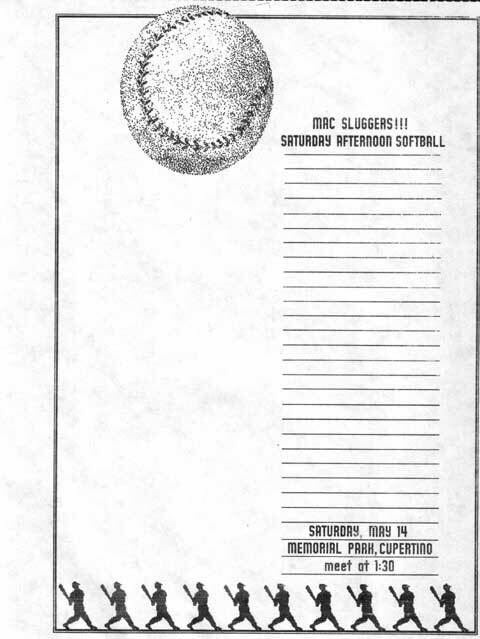 Here are some covers that she made for the June and July 1983 reports. 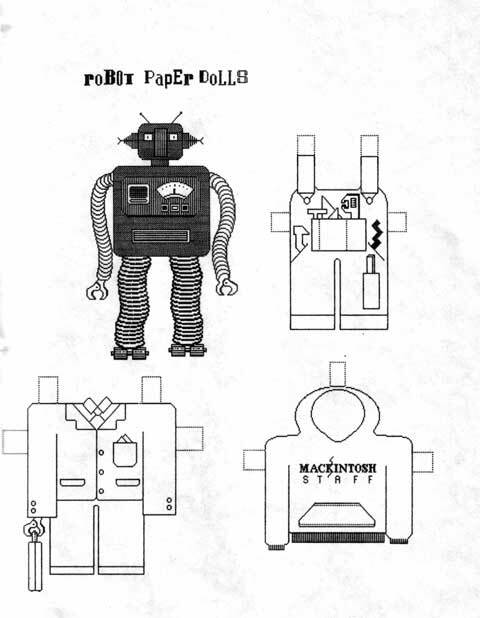 As we began preparing for the launch in the fall of 1983, Susan was requested to produce art for various marketing materials, to show off the kinds of things you could do with MacPaint. 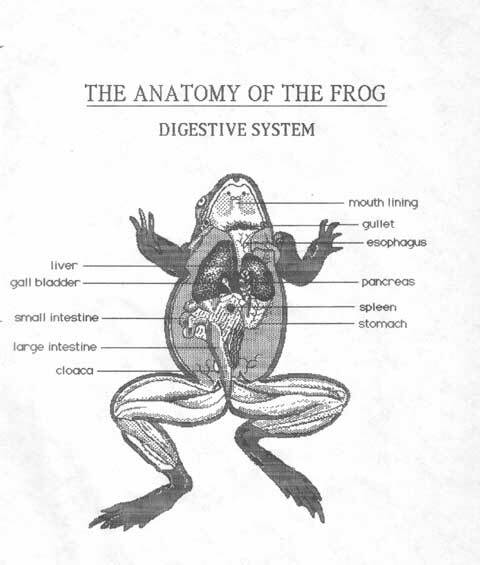 The frog on the left demonstrates how you might use MacPaint in a biology class. 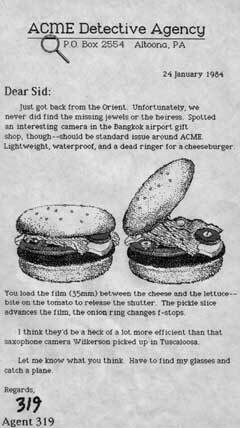 Susan also had a fondness for whimsical applications, as demonstrated by the one on the right. Here are some examples that Susan created for marketing. 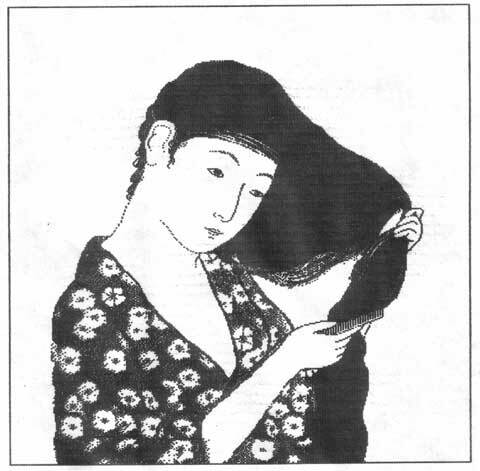 The "Japanese Lady" on the left is a pretty famous one, since it was used in the original brochure. She started with a scan of a fine Japanese woodcut that Steve had procured. I think the detective agency letter on the right was also used in an advertisement. 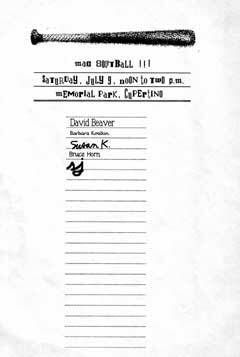 Sports were another outlet to blow off steam between longs hours of working. In the spring of 1983, we managed to get facilities to install a basketball hoop in the back of Bandley 4, and usually played a half-court game every afternoon. 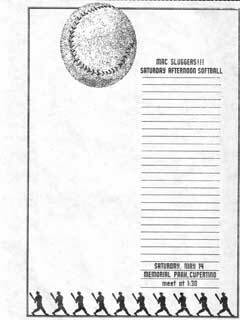 We also had co-ed softball games once per month, which could sometimes get pretty intense. 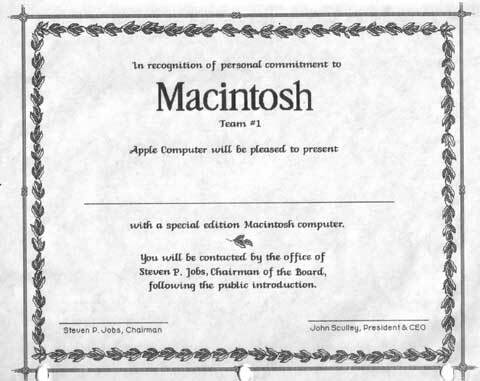 Apple gave out brand new Macintoshes to everyone on the team right after the launch (see The Times They Are A-Changin'); on the left is a certificate that accompanied each machine. 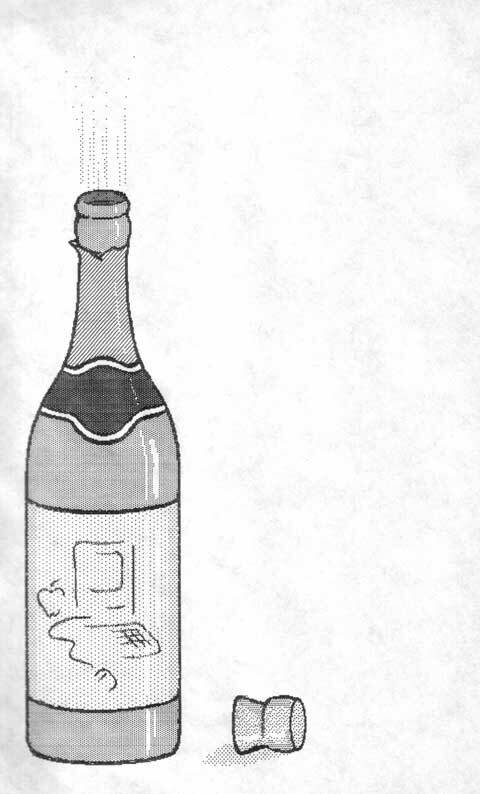 On the right is a bottle of champagne, in honor of the launch, to complete the celebration. wow, those are some awe inspiring images... MacPaint was no Photoshop, but from the looks of the scans above, it came pretty close! 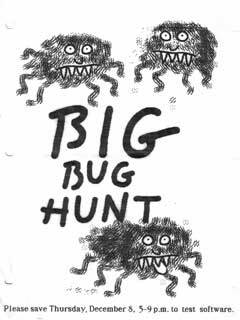 A lot of these graphics can be found in old Hypercard stacks, as well as older Scrapbooks from before System 7. 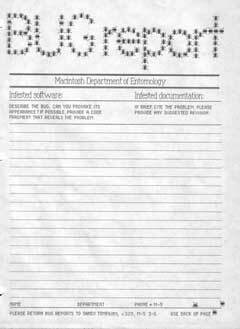 >Bring MacPaint back on earth!! Miss it a lot :-) No one has made a OSX clone yet???! Color would be nice.. Does anybody know if they ever planned a color MacPaint when color was finally added to the Mac (or was there one that I forget - or was MacPaint replaced by Claris-something by that time? 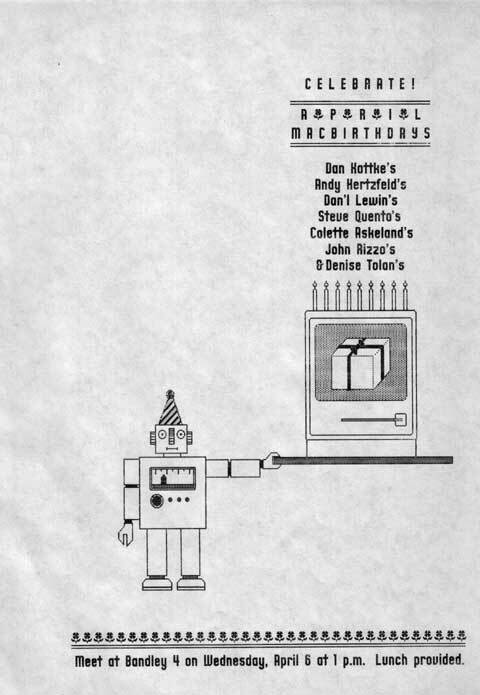 I forget my ancient Mac history..) What I'd really like to see here is stuff about the Newton - and parts of the code code for the ROM.. Headers for everything except proprietary parts of Paragraph and Rosetta/Inkwell recognizers, and possibly pieces of code for other things, like the details of how to use the higher-level parts of Newton QD such as the font structures - which look to be perhaps based on the superset of TextEdit). QuickDraw 3D 2.0 (the "New Era" demo IIRC) might be nice, and an official release to include the many QD3D SDK's sample programs with the Quesa distribution. 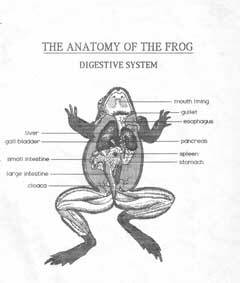 The text of this story is licensed under a Creative Commons License.